소렌토, 이탈리아의 카살레 눈지아티나 | 호스텔월드에서 예약하세요. Immersed into the green and surrounded by century-old olive trees and citrus grove Residence Casale Nunziatina is reachable by means of an ancient, carhateristic, roman road which is two meters wide and slightly uphill for the final 500 meters. 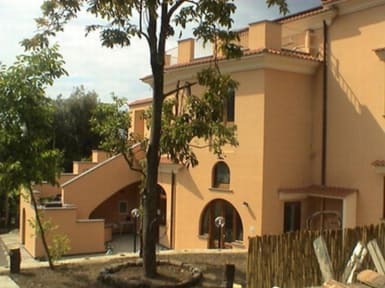 The spot is a total noise free environment , nearby the town center (800 meters ) but away from the city traffic and it is the ideal place to spent your holidays in relaxation and friendly atmosphere .The tranquility and the relaxation of the guests are fully guaranteed, along with their privacy, as the house is accessible through a private iron gateway. The Residence is formed by three independent apartments named Edera, Giglio, Gardenia at a ground floor of a beautiful villa . Each Apartment is including Bedroom , Bathroom with shower and hairdryer, Living Room and cooking area with all the utensils for self catering including frigo, and oven . The three apartments are well furnished and tiled. They may accommodate , respectively three, four or five persons. Between the bedroom and living room there are two doors , therefore two couples of friends can be accommodated sharing the ensuite bathroom and keeping their privacy. It is also available a four apartment which is named ROSA. ROSA is a single room apartment ,35 sq/mts. It is a roomy apartment and it is elegantly furnished. There are exposed ,many farming utensils used in the past once the Villa was a farming facility. Actually inside this room there is the history of Casale Nunziatina . The apartment is including : Bathroom with shower and hairdryer; a wide cooking area with all the utensils for self catering including oven and frigo; Table and chairs for lunch, Writing desk, Living area with armchairs and TV color; WIFI. Rosa apartment it is ideal for two persons, as there is a double bed which can be splint into two singles ,if required. ROSA Apartment is not equipped with washing machine which can be used on request.